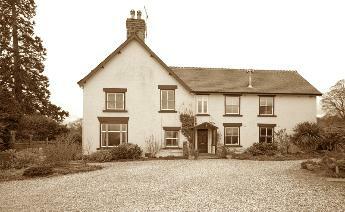 is situated three miles northwest from Mold (on the A541 Mold-Denbigh road) and eight miles south of Holywell. The village is located in the River Alyn valley. Once a district of Mold it was recognised as a separate parish from 1865. The geology of the area consists of a layer of extremely pure, and hence structurally sound, 200ft thick layer of limestone at depths ranging from surface to 900 feet. 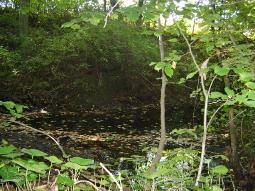 the mineral deposits in the Alyn valley created a population explosion in various villages, including Rhydymwyn. From the mid-1700s, Rhydymwyn was the site for a range of industries, which included foundries and a waterwheel as well as mine workings. The Mold and Denbigh Junction Railway had a station on the south side of the A541, which opened on 6 September 1869. With the closure of the line under the Beeching Axe , the station closed to passengers on 30 April 1962 and completely from 4 May 1964. The former station building is now a private house. There has been a Post Office in the village since 1894 and it was first located on the Nant Alyn road,some 100 yards from the main A541. and then closed after a short period, when a new building was opened in 1936.
by a Mr Thomas Hughes, a local man who owned several properties and land in the area. In the autumn of 2000, local rainfall was exceptional in terms of intensity and duration. Between 28 October and 6 November, 68 homes and 8 businesses flooded in Rhydymwyn because of overflow from the River Alyn. with a level of protection in excess of a flood with a 1% chance of occurring in any one year. The total cost for the scheme was £88,000. 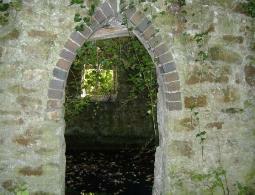 There is more to Rhydymwyn and Hendre than first meets the eye. homestead or winter dwelling, contrasting with a Hafod which was a summer dwelling, usually on higher ground. entertainers of the day and the BBC transmitted “Workers’ Playtime” from the Valley Works canteen. a remarkable engineering achievement, would have gushed with water. all of which were vitally important to both villages in their day, have come and gone. add to these the local traders and door to door deliveries and a busy picture can be imagined. 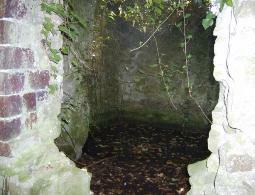 There were three chapels, the earliest at Garreg Boeth and two at Hendre. Only one building survives today but it is barely recognisable as it is now a light industrial unit. and the most recent school in Rhydymwyn, closed in 2007.
during harvest-time and chronicles the social history of the villages. St John’s Church still stands, as proudly in the centre of Rhydymwyn as it did when new in 1876.
often arriving by train at the village railway station. Nant Alyn campsite and later caravan park was always popular. attracting competitors and spectators from far and wide. The Antelope Hotel and Café was a popular stopping place for coach parties. Both villages have seen great social activity over the years with fairs, fetes, shows and sports days, and a wide variety of other community events. They have both experienced floods, and have both been tested in times of war and disaster. The villages have a fascinating and extensive history. Today is tomorrow’s history and hopefully the lives of today’s inhabitants will be of equal interest to the generations to come. The picture on the right shows the hooter from the Olwyn Goch mine in Hendre. It was given to the Y Dderwen -The Oak to be displayed there by Mr Berwyn Roberts of Caerwys. and then with Wimpy’s quarries here in Flintshire until 1993. The hooter from the Olwyn Goch mine was bought in a job-lot auction at a sale in 1979. The hooter was used at the mine right up to its closure. In December of 2001 the hooter was tested on an air line and still found to be working. will give you more details about the mine, the tunnels under Hendre and the surrounding countryside. work the old shaft was 8ft. out of true at its bottom. The Olwyn Goch had cages capable of carrying 16 men or two mine cars. when limestone was quarried underground and raised there. The speed of winding was 710ft. per minute or 8 miles per hour. sufficient for 500 men were built. and began excavating large amounts of stone to the area west of the Olwyn Goch. some up to 80 ft. high and if joined end to end would extend for some 2 miles. Limestone output was 70-80,000 tons per annum. No lead was mined from 1958-1964 as work centred on limestone mining at Hendre. A final jump in ore prices in 1964 kept a few men busy until 1977 but the work force never exceeded 40. For ten years work revolved around maintenance and tunnel repair until final closure in 1987.
these were let to the Ministry of Supply. the workings at the Olwyn Goch. The chambers stored enormous amounts of TNT. 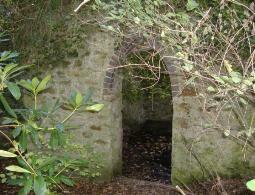 which stood opposite Mill House and the lead smelting works below Coed Du. inspired by the beauty of the countryside. and both his and Mendelssohn’s visits are commemorated by a plaque in Nant Alyn Road. owned by Denbighshire County Council. As a child I remember the great fetes held there by the Friends of Coed Du Hospital. I was speaking to a friend, who knows the area well, and he thought that the building was a bath house, probably used by the ladies of Coed Du Hall . Apparently there is a building at Powys Castle away from the castle and out of the prying eyes of gardeners!!! where the ladies could bathe. Yet another theory - could this building possibly be an immersion pool for a local church? 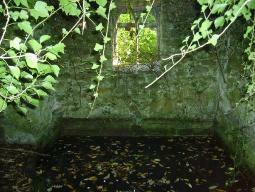 Apparently, in limestone country such pools were often constructed over a spring to ensure a regular supply of water. lies a tiny community consisting of pre-19th century to late Victorian buildings, the existence of which few are aware. 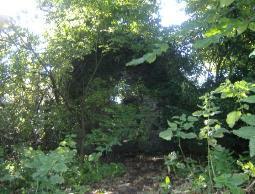 Many houses in the area were built for the convenience of the local miners or for people working on the Rhual estate. 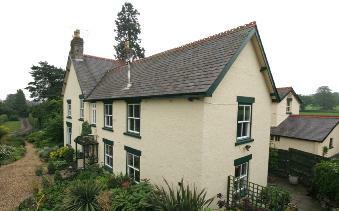 The two Bryn Huw cottages were built in 1947 for Rhual's coachman and bailiff. Four terraced cottages were built in 1909 and two of them are still owned by the Rhual estate. To live in an age of such little fear of crime and violence must have been bliss. One person interviewed remembered having to hike to school in Gwernaffield every day from the age of five with only his brother three years his senior for a companion. At five his own brother had had to walk alone. During the winter they would sledge to school and back- a picture never witnessed nowadays. she was unmarried with no known family so to keep her company she filled her spacious home with literally hundreds of cats. The next occupant -a Colonel Webber -installed a post box at the end of the lane adjacent to the Gwernaffield road for his own personal use. the top secret use of the building is widely known- the scientists residing there worked for the MInistry of Defence at Rhydymwyn. Several people in the article recall being invited to the ICI run parties as children. ICI often held massive 'dos' at Bryn bellan to draw together and strengthen the local communiites so naturally became very intimate with them. Apart from the presence of the Valley Works this area must have been considered reasonably safe as many evacuees were sent to the area from Liverpool. While ICI were resident in Bryn bellan they made enormous changes to the interior of the building. in which ICI used to hold dances and receptions. A good sized bar was situated to the left of the hall with beer and other alcoholic drinks running on tap. Every person setting foot in the house was treated as a guest and was always provided for as such. ICI seemed to be extremely generous. One house in the area next to Bryn Griffith Turnpike gained its name for obvious reasons. The field behind the cottage was owned by the mine owners as the public footpath running down the hill went directly to the pit at the bottom. This footpath was also used by hikers who wished to take a direct and easy route to the mountain on the other side-then an extremely popular walk. forcing people to pay the toll for the privilege of using the route to the mountain. A cottage was built next to the toll where cigarettes and sweets were sold and the money for the toll was collected. There were two quarries in the area, one was dug in 1930 and was in use for about 25 years. The stretch of road between the two quarries was constanly blocked but didn't cause a serious problem due to the comparitively tiny amount of traffic using the road. However when the gravel pits closed in 1955, tolerance began to wear thin. Huge gaping holes were left unfilled on either side of the road, some over 80 feet deep. Mold Urban District Council decided to solve the problem by filling the holes with rubbish. The occupants of Rhual and Bellan opposed the idea and the council agreed that the rubbish must not be piled higher than 1 foot above ground level. The villagers waited patiently for several years until the pile had climbed to 10 feet above ground level-and then ordered them to remove the lot. secured funding from Cadwyn Clwyd to produce a history book of the two villages. 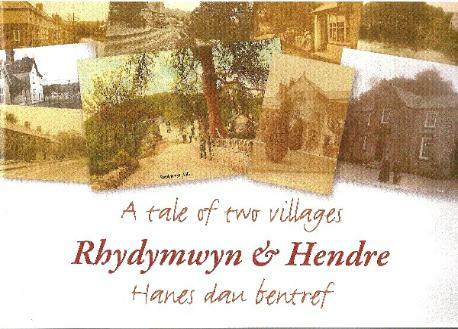 "Rhydymwyn and Hendre-A Tale of Two Villages"
including both modern and ancient history of the villages.